Viewing 24 of 34 items. One of our best sellers now in a smaller size. Size is 4.875" x 3.5". 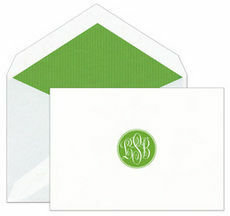 Set of 50 fold over note cards with matching envelopes in white or ecru. Return address printed with flat ink.. Exclusive to The Stationery Studio! Simple and Elegant! This set of 50 foldover note cards in white or ecru. Size is 4.875" x 3.5". Your choice of raised ink colors. Plain envelopes.. Exclusive to The Stationery Studio! Proper and sophisticated! This set of 50 foldover note cards in white or ecru. Size is 4.875" x 3.5". Your choice of raised ink colors. Plain envelopes..
A stunning and simple way to send a message! 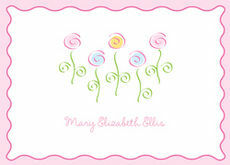 This set of 25 foldover note cards can be beautifully embossed on your choice of soft pastel stock color. Size 4.875" x 3.5". Embossed return.. Exclusive to The Stationery Studio! 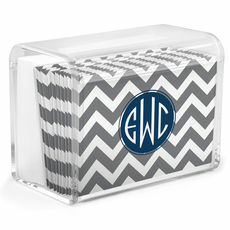 This set of 50 foldover note cards in white or ecru. Size is 4.875" x 3.5". Your choice of raised ink colors. Plain envelopes included. Flat printed..
A set of 50 foldover note cards. Size is 4.875" x 3.5". You select your favorite raised ink color on white stock. These come with blank matching envelopes. Return address printed with flat..
A set of 50 foldover note cards. Size is 4.875" x 3.5". You select your favorite raised ink color on ecru stock. These come with blank matching envelopes. Lined envelopes and flat printed..
A set of 50 foldover note cards. Size is 4.875" x 3.5". You select your favorite raised ink color on your choice of stock color. These come with blank matching envelopes. 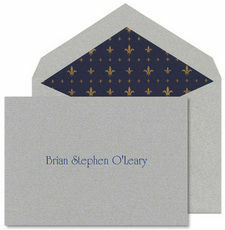 Lined envelopes and..
Royal styling! But nothing basic about this one. Set of 50 foldover notes in white or ecru with envelopes. Your choice of raised ink color. Size is 4.875" x 3.5". Return address printed with..
Set of 50 foldover note cards in your choice of stock color with matching blank envelopes. Size is 4.875" x 3.5". Your choice of raised ink colors. Printed return address printed with flat..
Set of 50 foldover note cards with matching envelopes in white or ecru. Raised ink color of your choice. Size 4.875" x 3.5". Flat printed return address available. 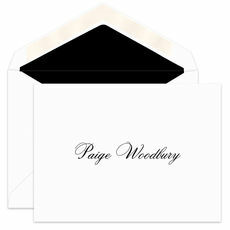 Typestyle and positioning..
Set of 50 bright white, foldover note cards with matching white blank envelopes. Size is 4.875" x 3.5". Flat printed in your choice ink color for block initial. 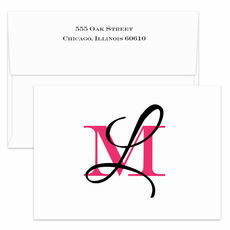 Large Script initial will..
Set of 25 foldover note cards printed on bright white stock. 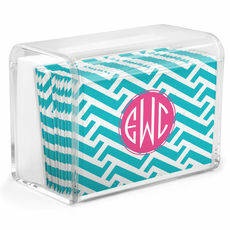 Printed in raised ink color and monogram style of your choice. Printed return address available. Positioning only as shown. Size is..
Set of 25 foldover note cards printed on grey stock with matching envelopes. Printed in raised ink color of your choice. Your typestyle of choice for imprint. Positioning only as shown. Size is..
Set of 20 foldover note cards, size 4.875" x 3.5". Blank envelopes are included. 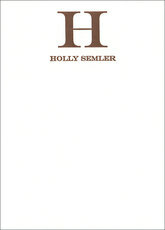 Flat printed in your choice of typestyle and ink color. Printed return address in flat black ink..
Set of 20 foldover note cards, size 4.875" x 3.5". Blank envelopes are included. Flat printed in your choice of typestyle. Ink color and positioning only as shown. Return address in flat.. This nice quality set of 50 ecru foldover note cards with stylish embossed framed border. Matching blank envelopes included. Size is 4.875" x 3.5". Printed return address printed with flat.. 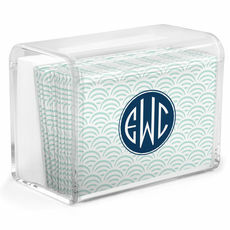 This set of contemporary foldover note cards in a clear acrylic storage box featuring a hinged top. Makes a perfect gift idea. Set of 25 small foldover note cards with matching blank envelopes. Size..
Set of 25 flat note cards featuring your initial and personalization. The initial and personalization is imprinted with a letterpress method on luxurious 100% cotton stock. Card size is 3.5" x 4.875".. 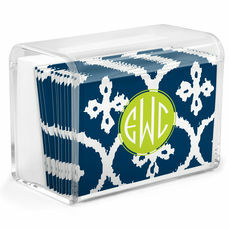 When just a little note is all you want to send, our section featuring smaller notecards should be perfect for you. For sweet little thank-you notes to show gratitude to someone special, The Stationery Studio offers a nice selection in their Petite Stationery section. The items in this section are all under 5x4" and are large enough for the perfect little note and sized perfectly so they can be mailed with one stamp. We think you will enjoy looking through our collection of great notecards. Each one of our little cards is designed so that you can add a unique touch to the way you say thank you. Whether you need cards for yourself or you would like to send them as a gift, you will be thrilled with our selection. 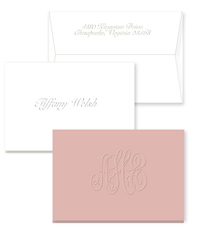 We are proud to bring you high-quality, innovative stationery products you can personalize your cards in many ways from first names to monograms and more. 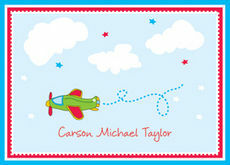 Our petite thank-you cards offer many design styles. Whether your style is traditional, artsy, whimsical or colorful, you can find a style you will love. These smaller notecards are perfect for quick notes and will provide a stylish presentation when printed and stuffed in corresponding envelopes. These cards will allow even the most minimalist writer a canvas for their thoughts and an impressive presentation.